Morgan’s FireMaster vessel fire protection system is being used to maintain structural integrity of the separators against jet and hydrocarbon pool fires. Fire protection is crucial because these separators contain hydrocarbon inventory, which can become additional fuel to a fire in the event of structural failure. Thermal weakening and failure occur when the walls of the separator are heated by the exposing fire case. With increased temperature of the steel vessel shell, the applied stress on it increases, causing rupture. Morgan’s FireMaster protection ensures that the steel shell temperature does not reach breaking point as temperatures surge. The design fire scenario stated that the separators should be able to withstand fire loads of five minutes of jet fire at 350w/m2, followed by five minutes of jet fire at 250kw/m2, and an additional 50 minutes of hydrocarbon pool fire. Morgan’s FireMaster solution was considered the most effective and easy-to-install option for the project, which had to be completed within the space of just one month. The initial plan for the project prior to Morgan’s involvement was to use traditional cellular glass, alkaline earth silicate wool, and stainless steel cladding. However, the project party agreed that it would be more beneficial to seek out a lighter, more immediate insulation solution. Morgan’s FireMaster vessel protection system met this brief, chosen for its strong and proven resistance to fire, its ability to provide a tested and certified solution for vessels, and its low rate of water absorption. The approach was to provide fire protection using FireMaster blanket alone with stainless cladding applied over the blanket to provide the necessary protection against erosion from the jet fire. 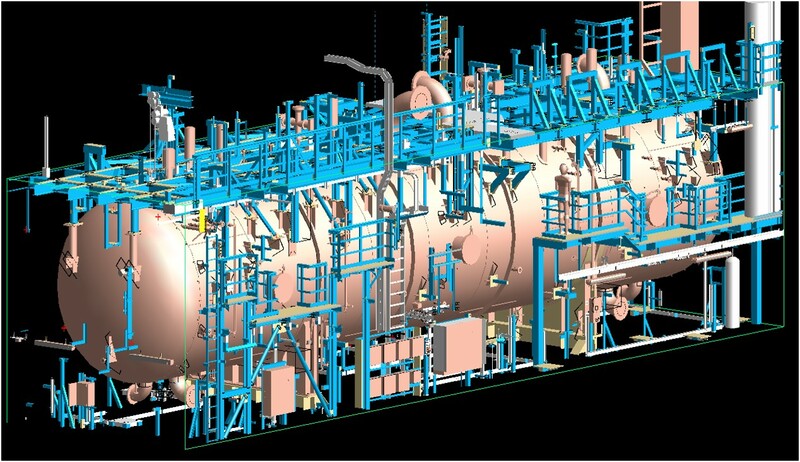 Upon receiving the design information, Morgan used its significant database of jet fire testing to validate finite element modelling to calculate the specified insulation thickness required to satisfy the critical temperature requirements of the vessel shell. 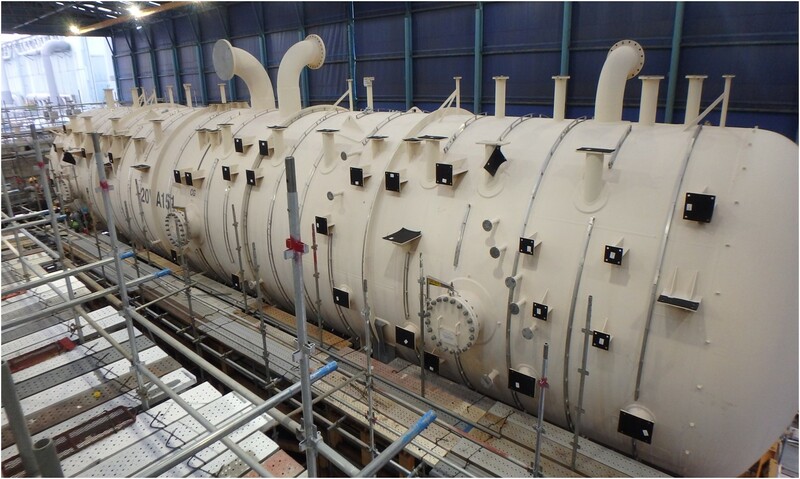 With the tight project timescale in mind, this process was accelerated and Morgan’s team of engineers advised that the first stage separator would require an insulation thickness of 50mm, with the second stage separator and test separator requiring a thickness of 63mm*. The penetrations, which were to be insulated after erection, would require a coatback of 150mm to reduce the heat input into the vessels. Consideration also had to be given to the nozzle welds, which are inspected after one year and subsequently every five years following that. To facilitate easy access, the inspection hatches were installed according to Statoil’s own insulation handbook. The subsequent air gap between the vessel surface and the wire mesh provided ventilation and reduced the risk of trapped water building up underneath the insulation. This further minimised the potential for corrosion under the insulation, which is a typical issue experienced in applied offshore insulation projects. The blanket was then encapsulated to reduce the potential for water absorption into the insulation system, helped by a FireMaster water repellent blanket.